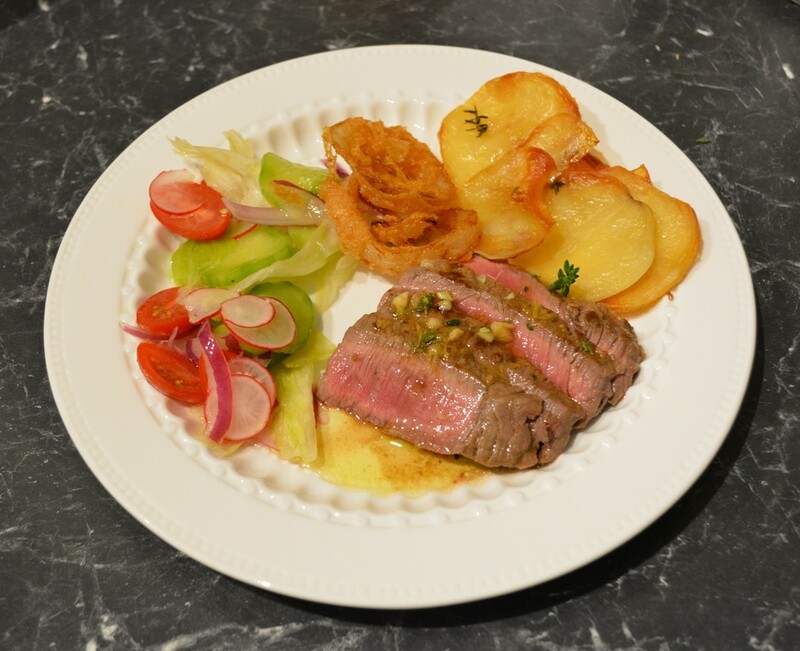 One of the easiest steak recipes you will ever make and it tastes amazing. Here you don't marinate the meat before cooking, you are marinating after you have cooked it. What are we having for dinner, a question I get asked every day. If you follow my blog you will realise I like to mix up what I cook, I like trying new things and I don't like repeating recipes often, I generally don't repeat things more than twice a year. There are exceptions to this rule and they are soups, we regularly have chicken, beef or lamb soups and if my husband or kids specifically request a recipe, I will make it. This dish was made as my son was going to be home late from school, so I wanted something I could cook quickly when he got home. We are a family that waits for the last person to get home before we have dinner. So tonight we had dinner at 8:30pm, not ideal, I like eating before 7pm, but sometimes late dinners can't be avoided. I had the potatoes baking in the oven, the salad was prepped and ready to dress at the last minute. 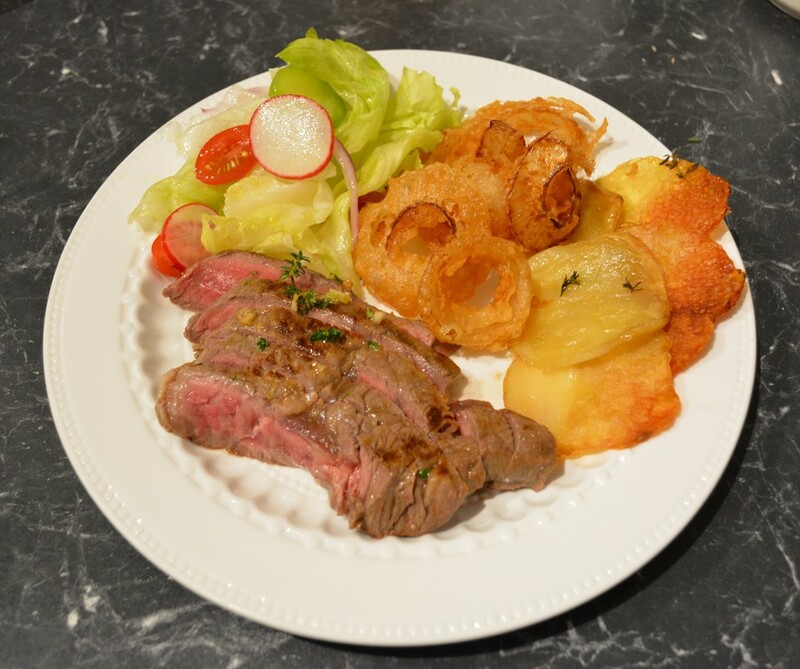 The steaks were out of the refrigerator at least an hour before cooking them and the onion rings sliced and ready to batter. As soon as my son came home, I heated up the oil for the onion rings and turned on my pan that I was going to cook the steaks in. The steaks need very little attention, they are so easy to make. The onion rings were quick to fry up and the salad was dressed and ready to go. Dinner was served in about 15-20 minutes. 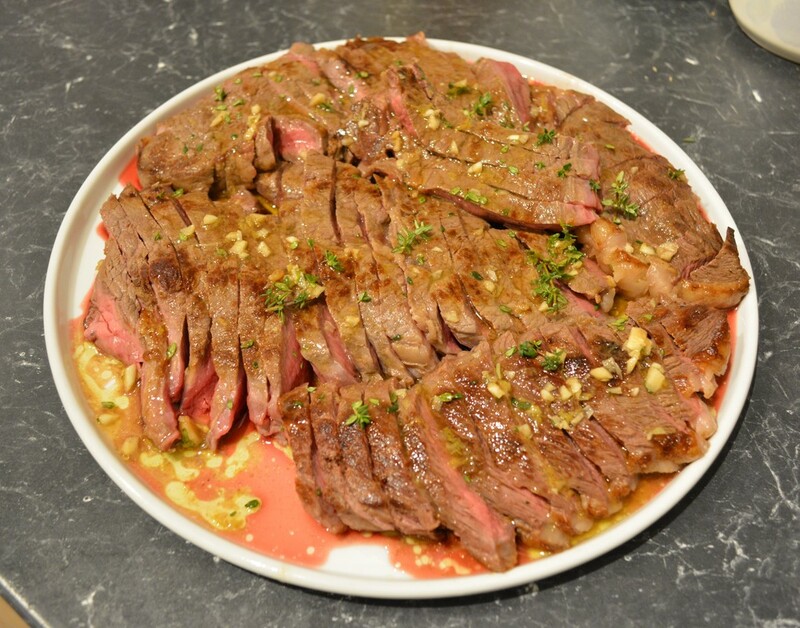 These steak slices are delicious, you pan fry the steak whole first, then place them it in the marinade after cooking to rest and get infused with this gorgeous dressing type marinade. Then you slice it, drizzle it with the marinade and serve immediately. How you cook the steak is up to you, we like it medium or medium-rare. If you want it cooked longer, just cook it longer. But you need to cook it, the lemon thyme flavour that permeates the meat is so delicious. You can substitute thyme for oregano or other herbs you love, but I have a fondness for thyme, I adore it. Also you can do this for a barbecue, you can double or triple the recipe, have the steaks barbecued, then place in a dish with the marinade, then simply slice and serve. Simple entertaining at it's best. I have also served this with broccolini and beans. I just boil or steam the vegetables, then drizzle over the marinade after the meat has been sliced. So delicious and again so easy. And leftovers, if there are any, are tasty cold. I don't generally like cold beef, however, place leftovers in a bowl, pour over any leftover marinade and you will enjoy it tomorrow. So if you are looking for a quick and easy mid week dinner, these steaks are amazing, you really need to try it. Remove the steaks from the fridge at least 1 hour before you are going to cook them. ​Remove any fat from the edge of your steak. Heat a griddle or heavy based pan over medium-high heat. (On my really hot burner I had it on just past the medium point). Heat the pan until it is hot. Season steaks with a little salt and pepper. Brush the steak with a little oil, then place in your hot griddle or pan, and cook for 3 minutes on each side, then turn again for a further 1 minute on each side for medium-rare meat. If you like you meat cooked more, just cook it longer, before each turn. While your steak is cooking, get your marinade ready. Place the thyme leaves, garlic, oil, lemon zest and juice in a wide shallow dish, it needs to fit your steak in it. Season the marinade with salt and pepper. Once the steak is cooked to your liking, place it in the dish and marinade for 4 minutes on each side, losely covered with foil, before removing it to a board and slicing it on the diagonal. ​Place on a serving plate, drizzle over some of the marinade. Serve immediately with beans or broccolini or as picture with a salad, baked potatoes and onion rings.